The municipality of Sparta (35,259 inhabitants in 2011, 11,898 ha) was formed in the 2011 local government reform by the merger of the former municipalities of Faris (Φάρις, 5,269 inh. ), Karyes (Καρυές, 926 inh. ), Mystras (Μυστράς, 4,608 inh. ), Oinountas (Οινούντας, 2,625 inh. ), Pellana (Πέλλανα, 3,405 inh. ), Sparta (19,854 inh. ), and Therapnes (Θεράπνες, 3,062 inh.). The earliest evidence of human settlement in the region of Sparta consists of pottery dating from the Middle Neolithic period, which are the earliest traces of the original Mycenaean Spartan civilisation, which seems to have fallen into decline by the late Bronze Age, when, according to Herodotus, Macedonian tribes from the north marched into Peloponnese, where they were called Dorians. Between the 8th and 7th centuries BC the Spartans experienced a period of lawlessness and civil strife and carried out a series of political and social reforms of their own society which they later attributed to a semi-mythical lawgiver, Lycurgus. In the Second Messenian War, Sparta established itself as a local power in Peloponnesus and the rest of Greece. In 480 BC a small force of Spartans, Thespians, and Thebans led by King Leonidas made a legendary last stand at the Battle of Thermopylae against the massive Persian army. One year later Sparta led a Greek alliance against the Persians at the battle of Plataea. The decisive Greek victory at Plataea put an end to the Greco-Persian War along with Persian ambition of expanding into Europe. Even though this war was won by a pan-Greek army, credit was given to Sparta, who had been the de facto leader of the entire Greek expedition. In later Classical times, Sparta along with Athens, Thebes, and Persia had been the main powers fighting for supremacy against each other. As a result of the Peloponnesian War, Sparta, a traditionally continental culture, became a naval power. By the end of the 5th century BC it stood out as a state which had defeated the Athenian Empire and had invaded the Persian provinces in Anatolia, a period which marks the Spartan Hegemony. During the Corinthian War Sparta faced a coalition of the leading Greek states: Thebes, Athens, Corinth, and Argos. The alliance was initially backed by Persia. Sparta achieved a series of land victories, but many of her ships were destroyed at the battle of Cnidus by a Greek-Phoenician mercenary fleet that Persia had provided to Athens. The event severely damaged Sparta's naval power but did not end its aspirations of invading further into Persia, until Conon the Athenian ravaged the Spartan coastline and provoked the old Spartan fear of a helot revolt. As Spartan citizenship was inherited by blood, Sparta now increasingly faced a helot population that vastly outnumbered its citizens. After a few more years of fighting, in 387 BC the Peace of Antalcidas was established, according to which all Greek cities of Ionia would return to Persian control, and Persia's Asian border would be free of the Spartan threat. Sparta entered its long-term decline after a severe military defeat to Epaminondas of Thebes at the Battle of Leuctra. Sparta never fully recovered from the losses that the Spartans suffered at Leuctra in 371 BC and the subsequent helot revolts. Nonetheless, it was able to continue as a regional power for over two centuries. Neither Philip II nor his son Alexander the Great attempted to conquer Sparta itself. During Alexander's campaigns in the east, the Spartan king, Agis III sent a force to Crete in 333 BC with the aim of securing the island for Sparta. Agis next took command of allied Greek forces against Macedon, gaining early successes, before laying siege to Megalopolis in 331 BC. A large Macedonian army under general Antipater marched to its relief and defeated the Spartan-led force. Alexander then forced the Spartans to join the League of Corinth, which they had previously refused to join. During the Punic Wars Sparta was an ally of the Roman Republic. Spartan political independence was put to an end when it was eventually forced into the Achaean League. In 146 BC Greece was conquered by the Roman general Lucius Mummius. Following the Roman conquest, the Spartans continued their way of life, and the city became a tourist attraction for the Roman elite who came to observe exotic Spartan customs. In the Middle Ages, the political and cultural center of Laconia shifted to the nearby settlement of Mystras. Until modern times, the site of ancient Sparta was occupied by a small town of a few thousand people who lived among the ruins, in the shadow of Mystras. The Palaiologos family (the last Byzantine Greek imperial dynasty) also lived in Mystras. The origins of modern Sparta date back to 20 October 1834, when King Otto issued a decree on the construction of the new city. Bavarian city planners, headed by Fr. Stauffert, designed a city of 100,000 inhabitants based on the neo-classical architectural model. 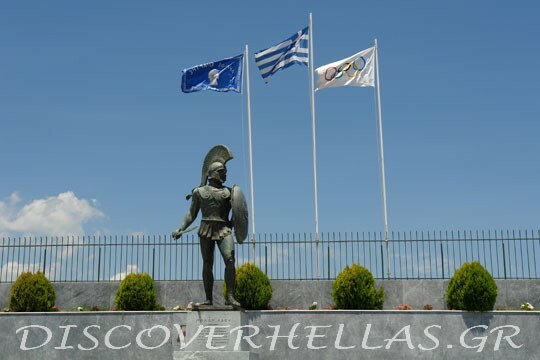 The flag of Sparta (Kokkonis website), is celestial blue with white Greek ornaments on the four sides, a representation of the head of the statue of King Leonidas and the the words ΔΗΜΟΣ ΣΠΑΡΤΗΣ. The flag is still used by the new municipality (photo, photo, photo). Situated on Mt. Taygetos, near ancient Sparta, Mystras became in 1249 the seat of the Latin Principality of Achaea, established in 1205 after the conquest of Constantinople during the Fourth Crusade, and Prince William II Villehardouin built a palace there. In 1261, the Latins ceded Mystras and other forts in the southeastern Peloponnese as ransom for William II, who had been captured in Pelagonia, and Michael VIII Palaeologus made the city the seat of the new Despotate of the Morea. It remained the capital of the despotate, ruled by relatives of the Byzantine emperor, although the Venetians still controlled the coast and the islands. Under despot Theodore it became the second most important city in the empire after Constantinople, and William II's palace became the second residence of the emperors. The last Byzantine emperor, Constantine XI Palaeologos, was despot at Mystras before he came to the throne. Demetrius Palaeologos, the last despot of Morea, surrendered the city to the Ottoman emperor Mehmed II in 1460. Except a Venetian occupation from 1687 to 1715, the Ottomans held it until 1821 and the beginning of the Greek War of Independence. In the 1830s, the fortified town was abandoned and the new town of Sparta was built, about eight kilometres to the east. In 1989 the ruins, including the fortress, palace, churches, and monasteries, were named a UNESCO World Heritage Site. The flag of Mystras (Kokkonis website) was yellow with a Byzantine eagle and the name of the municipality. Spartathlon (website) takes place every September since 1983. It is an ultramarathon race held anually covering a distance of 246 km starting in Athens and finishing in Sparta. It aims to trace the footsteps of Pheidippides, an Athenian messenger sent to Sparta in 490 BC to seek help against the Persians in the Battle of Marathon. Pheidippides, according to an account by Greek historian Herodotus in The Persian Wars, arrived in Sparta the day after he departed. The idea for its creation is belongs to John Foden, a British RAF Wing Commander. As a lover of Greece and student of ancient Greek history, Foden stopped his reading of Herodotus' narration regarding Pheidippides, puzzled and wondering if a modern man could cover the distance from Athens to Sparta, i.e. 250 kms, within 36 hours. He thought that the only way to find out was to try to run the historical course since he himself was a long-distance runner. Thus, he and four other colleagues from the RAF came to Athens in the autumn of 1982 and planned the run as closely as possible to Herodotus' description. On 8th October they started their adventure to see whether their speculations could be verified. On 9th October, the next day, John Foden arrived in Sparta in front of the statue of Leonidas having run for 36 hours. His colleague, John Scholten, had arrived half an hour earlier and finally, John McCarthy got to the finish line in less than 40 hours. The British team proved Herodotus was right! A man is really able to cover 250 km in two days. The flag of Spartathlon (photo, photo, photo, photo) is white with the logo of the race and its name below (in English) in blue capital letters.